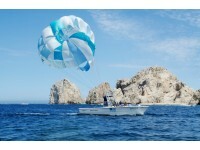 San Jose del Cabo is the county seat of Los Cabos, at the southern tip of Baja California Sur, Mexico. For hundreds of years, it was the only community in Baja California. Thanks to its natural water estuary along the coast, San José sustained Indian communities, flora and fauna long before the Spanish colonization. It was an obligatory stop for the Spanish galleons to resupply water and provisions during the pre-colonial period. San José del Cabo was finally established as a city in 1730 with the construction of a Jesuit mission and a fort to help stabilize the region in defense against pirates. Currently, the area known as Los Cabos comprises San José del Cabo and Cabo San Lucas, joined by a tourist corridor along the 33-kilometer (20.5 mi) coastal strip, where in addition to the extraordinary beauty of the landscape with beaches suitable for all water sports, a large variety of tourist services is provided. San Jose del Cabo is a picturesque village featuring the best of Mexican tradition in its quiet tree-lined streets, where art galleries, fine restaurants and boutiques abound. The historic center of the city, located a few blocks from the sea, is to be explored on foot. Visit this beautiful avenue known as Bulevar Mijares, flanked by large, leafy trees, the landscaped Central Square, surrounded by the powerful presence of the colonial Parish of San José, and the beautiful Spanish colonial-style city hall with outstanding murals painted on its walls. The main attraction of San José del Cabo is its undoubtedly its beaches. The particular desert environment contrasts with the sea, surrounded by bushy hills with a variety of cactus and the most peculiar desert vegetation. Among its most famous beaches are Punta Palmilla, Costa Azul and Santa Maria, where you can go surfing, snorkeling and diving. The estuary of San José del Cabo is an ecological paradise, habitat for many species of tropical birds, with a variety of flora. When it comes to luxury, San Jose del Cabo has some of the most exclusive hotels and resorts in the world, although it also offers all types of accommodations, including all-inclusive services. It is also distinguished by its majestic world class golf courses. Other popular activities include horseback riding, biking or rides on ATVs to explore the beaches, the mountains and the desert landscapes. *** The official currency of Mexico is the Mexican Peso (MXN).